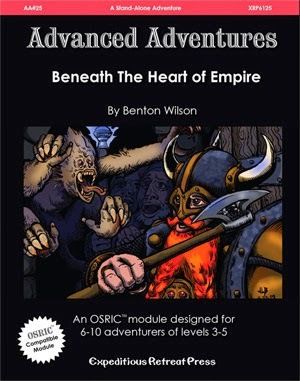 Beneath the Heart of Empire by Benton Wilson is a fairly short dungeon crawl for OSRIC (the retro clone of 1st Edition AD&D). It is #25 in the Advanced Adventures line from Expeditious Retreat Press, and meant for 1st to 3rd level characters. At 8 pages, it's rather short, though it manages to have 47 keyed locations, plus a smattering of background. That background makes it perhaps a bit tricky to fit into most games, it's essentially set benearth a fantasy version of Rome. Not a few fantasy settings have a Rome analog, but it's not overly common, either. And you can't really divorce it from the setting, as many of the encounters have a Roman flavor, like gladiators, or a former arena where they fought. For the most part, the quality of the encounters is decent enough. Not much really outstanding, perhaps too many kobolds, but no giant rats, and there are 4 new monsters: the addlveitch (a carnivorous cactus), the dust centurion, ember devil, and the furrower (a slimy tentacled sewer monster). No puzzles. There isn't any interior artwork besides the frontispiece. The maps are also placed inside the text and on separate pages, which is mildly annoying in actual use. It's really not a bad module, but like many in the Advanced Adventures line, it really cries out to be longer. Fitting an adventure (including the maps) into 7 pages is probably 5 pages too short. It's also hard to say it's worth $6 for the PDF, or $10 for the print, at least when there are so many modules the same size for a much lower price, or much larger for only a few dollars more.